Gucci "Running G" stud earrings. Pavé diamonds trim GG logo. For in-store inquiries, use sku #2458773. Gucci "Running G" stud earrings. 18-karat gold. Signature GG design. For pierced ears. Made in Italy. 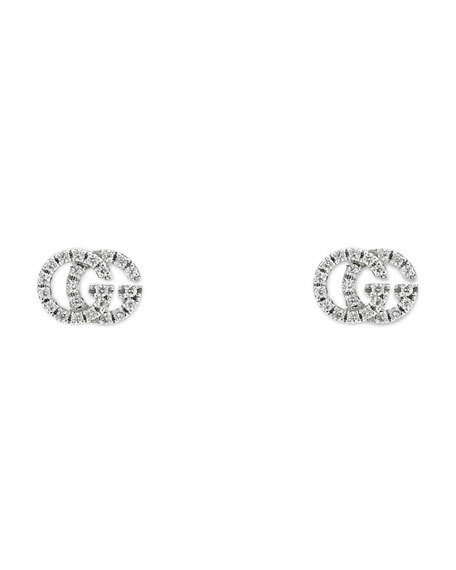 GG Running diamond earrings by Gucci. Polished 18-karat yellow gold hardware. Double-G studs with white diamonds. 48 diamonds; 0.11 total carat weight. Post backs for pierced ears. Approx. 0.3"H x 0.5"W. Made in Italy. Gucci "Run G" stud earrings. 18-karat yellow gold. Round topaz. citrine, sapphire, and tsavorite. For pierced ears. Made in Italy.